Game started on Janury 8th, 2001. Feel free to add your moves or commentary to this game, and we'll see what happens.. Please mark the most recent move! 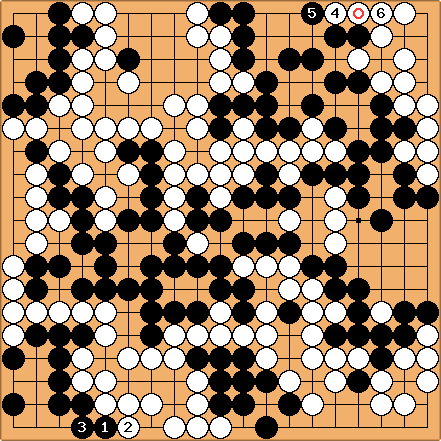 Community Goban: White wins by 20. Here's a suggestion to make this easier to follow and to make comments saved for posterity: Use the move numbers 1-10, repeat the board after 10 moves. Add comments on each move as it is played (if applicable) - the finished game will be very interesting this way. BillSpight: Black 1 - Black 3 gets the last one point move (miai counting). Sometimes that affects the score (See Mathematical Go, Tedomari, and Go Infinitesimals), but here there is a smaller play left for White, so it does not matter. White 4 - White 6 is worth 2/3 point. If Black plays at 4 he saves one point at 5 and gains 1/3 point for White's ko stone (marked). BillSpight: Black takes his one-point sente plays. The order does not matter. 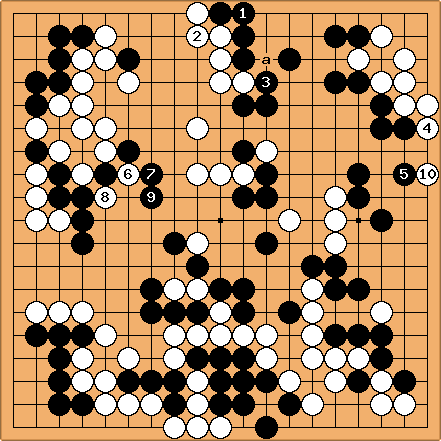 Note that Black chooses the sente option for the ambiguous play (Black 9). He could have played it in gote at 10. Making it sente lets Black get the last one-point play (a matter of pride only, here). White could have gotten the last 1 point play by not filling his own liberties in the top right section (White 240, White 248), but that would not have changed the score. BillSpight: My apologies to HolIgor, who I think has been waiting to play White 250. His calculation is correct. At stake are 2 points (circled) plus 1/2 point (the square) in gote. After White 250 the game is essentially over. There is a point I wanted to make, so I just played it out. DieterVerhofstadt: pardon me for still following Ogawa's endgame terminology. Black 249 is worth 5 points: 3 points in gote, preventing a 1 point sente follow-up by White and creating a one-point sente follow-up itself. The move at a is difficult to calculate but is less than 3 points. Bill, I'll buy your endgame book. HolIgor, White 244: The value of the gote play at a is 1.25 miai counting. White 4 is one point only with the temperature of 1.5. Is it sente? Bill: Yes. White 4 is a one-point sente play. Holigor, White 266: Every move now should be measured against the biggest gote at a. I think that it is better to push from this side first than from the left because otherwise this move would be a little bit depreciated. It seems to me that this yose is very much biased in White's favour. White has many more sente moves and got most all the big points. I wonder why. Was White thicker in the middle game? Note that White had sente against both black corners, the large White 201, a lot of sente moves in the middle. HolIgor: It did not work, but, still a point. Bill: It worked, all right. Well done! dnerra: May I suggest that Black resigns? HolIgor: Black did resign long ago, but the game is open. If somebody makes a move for Black, White replies. TakeNGive: Resigning is good. Nevertheless, I played several moves for both sides here, thinking that a finished and counted game might be good to put in the TeachingPaths / BeginnerStudySection for beginners to look at. But I don't know if this game is suitable for that; what do y'all think? HolIgor: This game is as good for the beginner's section as any well-commented game. It had some life-and-death, some big mistakes and some excellent fighting closer to the yose. Most moves are well commented. It did not have a large-scale ko though, which could be ideal for an introduction. The game can be finished fast but making moves in the correct order in yose is an art and it should be done slowly. There is a slight problem with counting because we did not follow all the captures. But I have an SGF file somewhere. One can count Chinese style, too. Move 228: This move raises the local temperature, so I guess it is sente. BillSpight: Black 229: I hear and obey. White threatened a. Discussion continued on Ongoing Game 1 / B229 Error. Black 223 is dubious (atari atari). White has to fill at 224, anyway. 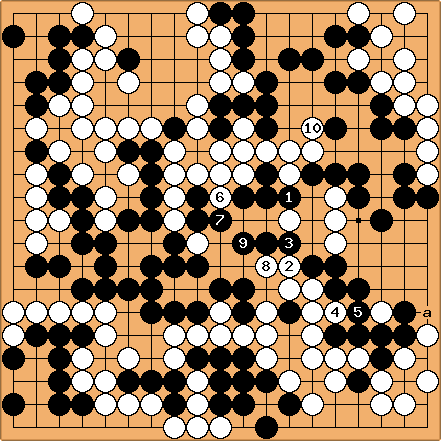 HolIgor, White 230: White has two two-point gote moves and a lot of one-point sente moves. It is time to play sente, I guess, though Black may play his sente in between. I think that 225 was not good. It was a gote sequence that did not gain much while White became solid. The play b could do the job better. Now the score is 20+ points in White's favour. HolIgor, 218: this 2.5 point gote seems to be the largest move. What about a komi? 18 points reverse komi and the game is alive. -- Kapunga 191: This starts the capturing race so it ends in Black's favor. unkx80 191: I don't think 188 is the correct way to play, resulting in Black winning the capturing race instead. Instead, 188 should be played at 189. -- HolIgor 198: At last we came to the yose in all corners of interest. White 198 seems to be sente. Can Bill tell us how much it is worth? By the way, wouldn't it be nice to have a treatise on the counting yose technique here? I am still quite confused about different systems of counting and how to apply them. A pointer to a place where this could be learned would be nice too. As for yose calculation, Professor Berlekamp and I are planning a book that will cover both traditional evaluation and our recent advances in ko evaluation. The first thing to do is to master gote evaluation. For sente you can start by assuming that they are gote, and then seeing that they are not, because if they were, the response to them would be bigger than they are. TakeNGive: OK, I'm guilty. 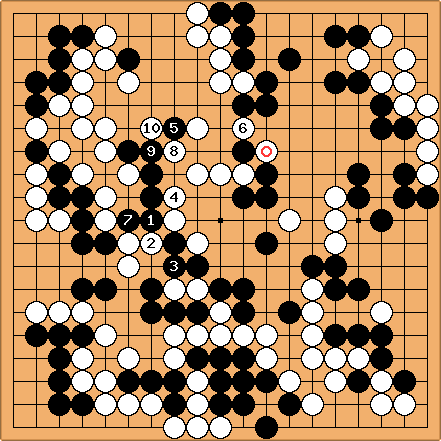 I moved Black 199 one point to the left of tengen. Then I realized White could force a ko in the upper left, and changed the move. Sorry. --DaveSigaty 184: This may be a more exciting finish than White needs but it "looks" like it works :-) Who is shorter of liberties? unkx80 184: Whoops... I have read the situation wrongly. Sorry. However, may I ask whether 175 would be better off playing one space below instead? HolIgor 185: Let's play anyway. There are many interesting variations left though the score has shifted to White's favour. About move 175. I suggested to unkx80 that he post an improvement. Then we will know where Black blundered. Personally, after playing 172, I was very intrigued to see if Black connected. The loss at the right side was not that big, but the fight in the center was obscure. And I think that at 167 Black had to fight the ko. At least, to take it once. One could always back down later. At the same time White could blunder with ko threats that made Black thicker. DaveSigaty 186: Here is where the potential trade off between Black's center stones and the right side comes in. 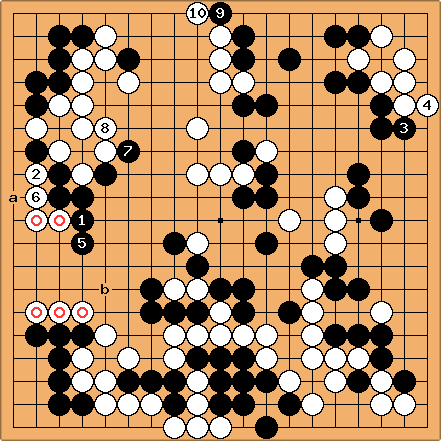 I think that Black can't both save his stones and prevent White from extending to the right from the marked stone. Black's choice. HolIgor 187: There are only about 8 points in the region to the left and the balance of killed/saved stones here is much larger. But the score is now in the range of 10-20 points for White. I don't know if playing yose in a game the result of which is known is interesting enough. We do not have proper mechanism of resignation. I guess it would be a silent resignation, which means that if somebody wants to continue, he is welcome to post moves for Black. I am sure that White will reply. Is it time to start OngoingGame2? And I think that all participants should share their impressions from the game on Ongoing Game 1 / What went wrong page. DaveSigaty 188: The black cut at 187 is possible but only just. White can use Black's shortage of liberties to seal off more than 15 points of territory at the top before extending on the right. I agree the game is decided now. The upper left corner and lower left corner are interesting endgame shapes that are worth knowing. What is correct for Ongoing Game 1 / Upper Left Yose and Ongoing Game 1 / Lower Left Yose, as well as Ongoing Game 1 / Upper Right Yose ? DieterVerhofstadt 175: Necessary. If next White's hane, a little reading is required. HolIgor 176: Obviously White plays hane. This way is the most interesting. It seems that Black cannot cut at the moment. AndreEngels 177: Black has problems: saving the stones on the left and those in the center does not seem to be possible simultaneously. unkx80 177: I beg to differ. Black should be able to save both groups, but how... I guess I should not comment until the moves are played out. DieterVerhofstadt 178: Differ again. I think a trade of the marked stones is coming up. Unmark as you please. DaveSigaty 180: I think that almost any stones may live or die in this situation. I don't think that Black can save both groups without White breaking into the right side using the aji of the square-marked stones. White needs to be careful to avoid traps set for her stones in the center as well. DaveSigaty 169: Everyone seems to think the game is over! I think there is still a lot to sort out in the center and the yose. I'll bite with this play. DieterVerhofstadt 168 : Another positional judgment? Alain Wettach (163): Seems necessary to prevent White a. I think that White could have played at a instead of 162. Black 159 was probably a mistake. Matt Noonan (159): Not sure about the timing here, but I think it is big enough to warrant White's response. Andre Engels: If White has to answer after 161, there is no problem, but if White can take sente, then 159 might well be too small for this stage of the game.